Parker Caracci rolls a strike to the mound. Photo by Petre Thomas/Ole Miss Athletics. 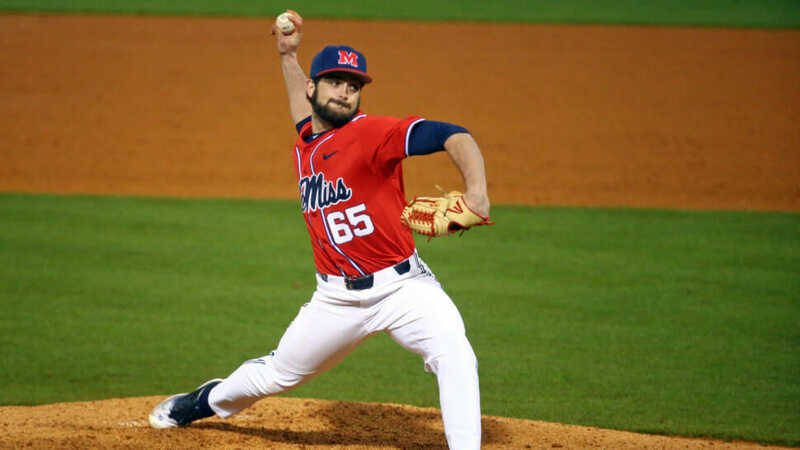 The Ole Miss baseball team was named to its second preseason Top 25 ranking on Monday by D1Baseball. The sports ranking website has the Rebels at No. 10 going into the 2019 season. Ole Miss is one of five teams from the SEC in the Top 10. Vanderbilt, LSU, Florida and Georgia all are ahead of the reigning 2018 SEC Tournament Champions. Last season, the Rebels run ended at home in the Oxford Regional to Tennessee State in the championship game. A total of eight clubs from the conference are listed in the Top 25 poll. The Rebels begin their road to Omaha against Wright State in a three-game series opener Feb. 15-17. First pitch is slated for 4 p.m.